This page gives an overview of our main projects and some directions on the type of funding assistance that is available to our environmental groups and network. More details of these projects are given in the specific sub-section pages linked from this page. This project was carried out at Ferny Grove with the support of Brisbane City Council, the Lord Mayor's Suburban Initiative Fund and Enoggera Ward. 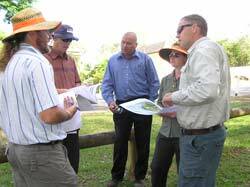 Following an initial launch of the project at Arbor Park on 6 November 2010, there was a small workshop held on 20 November for people interested in conducting glider surveys at Ferny Grove. Local ecologist, Damian White, discussed the background to the surveys, and described the six glider species with a past history within Queensland, and the various techniques that are used to locate and identify gliders in their habitats. This workshop was immediately followed by the first survey. It was led by Damian over the next two hours looking for gliders in bushland adjacent to the Ferny Grove High School and in Arbor Park. 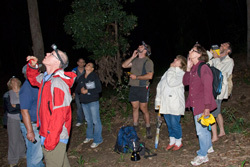 After several Ringtail possums were spotted, the group was thinking it was unlikely a glider would be spotted. However, this turned out to not be the case with two Squirrel gliders spotted; one even gliding between the trees for the group. A Tawny Frogmouth was also spotted on the evening. It is fantastic to know in our project that there are in fact gliders in Ferny Grove. Two surveys were carried out with similar success. The results of the three surveys will help in planning future actions to help gliders and other wildlife survive in the suburbs. To celebrate the success of the Glideways in Ferny Grove Project (i.e. that we found Squirrel Gliders!) the Kedron Brook Catchment Branch wrapped up the project with a community tree planting day in the bushland at Tramway St, alongside the Ferny Grove State High School where our furry friends were found. It was held on Saturday morning 9 July 2011 followed by a morning tea. A tree planting was carried out to increase the glider habitat for the future. Later in 2011, Ecologist Damian White submitted to BCC his report , 'Short report on the Glideways project (Ferny Grove - Brisbane City Council glider project) undertaken in the Kedron Brook Catchment, Ferny Grove, Brisbane City'. A pdf copy of this interesting report is available by link on this website. The partnership with Powerlink has provided a rare opportunity to rehabilitate a large area of urban bushland on private property along Kedron Brook. The successful outcome of this project will bring significant environmental benefits by providing quality habitat for wildlife and by improving the water quality of the upper catchment of Kedron Brook, one of Brisbane's important riparian corridors. Link to the Wahminda Grove - Powerlink Project for more details. 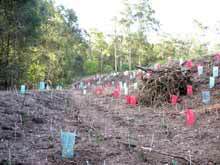 As part of the railway upgrade from Ferny Grove to Keperra over 2010-2012, Queensland Rail was committed to reducing its impact on the environment and worked with our local bushcare groups to sponsor revegetation of nearby areas at Bob Cassimaty Park. Kedron Brook Catchment Branch, alongside Brisbane City Council (Habitat Brisbane and Creek Ranger Field Services), worked with Men of The Trees on a four stage plan to plant over 3,300 native plants and trees in Bob Cassimaty Park to compensate for the loss of various native trees and vegetation that had to be removed for the railway upgrade. Full details are given on our special project page. The upper reaches of Kedron Brook and its major tributary, Cedar Creek, were identified as one of the focus areas for this project. These parts of the catchment maintain strong corridor linkages with Brisbane Forest Park and are important for protecting downstream water quality. The project built new partnerships with land managers in this area as well as supporting community groups who were already involved in catchment management activities. Extension of this project will be considered by our Committee should additional funding be obtained. Details are given on our web page. This project was proudly funded by a Lord Mayor's Community Sustainability & Environmental Grants Program Grant from Brisbane City Council. For some years there had been a strong local interest in this parkland that, for its length, mostly parallels Camoola St, Keperra (UBD 137 ref P5). A significantly sized rivulet passes throughout the length of this park; eventuallly crossing Keperra Golf Club to join Kedron Brook near Brook Park. Although this watercourse is relatively weedy, there are plenty of beautiful, well established eucalypts throughout the park. There was a strong potential that this park could be readily enhanced with regard to improvement of wildlife habitat and it's natural beauty for the local community. It was therefore timely that in 2013, Kedron Brook Catchment Branch - WPSQ was successful in obtaining a grant for $8,000 from the Brisbane City Council to augment and upgrade the native vegetation in this park. On Sunday morning 3 May 2013, a joint group of representatives from Men of the Trees, KBCB and local Keperra volunteers met together with BCC staff to discuss the best way to launch this project.This led to the formation of a local group, in particular, operating with the help of Habitat Brisbane. Annie Morris became the contact person for the Camoola Street Park tree planting project. This was carried out over 2013 using a combination of working bees by the local community supported by KBCB, Men of the Trees (MOTT) and contractors approved by BCC. In June, 2014, official approval was given by Brisbane City Council for this community group to become an official Habitat Brisbane bushcare group. This group's web page has been set up in the Bushcare Group section to cover news about past and present activities at this location. 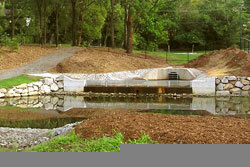 Late in 2008 the Kedron Brook Catchment Branch was awarded a Federal Grant to undertake a habitat restoration project on the northern banks of Kedron Brook in Kalinga Park (Nundah). The grant was a Federal Caring for Our Country Grant. Details about the initial project are given on our project web page. There is now a Habitat Brisbane bushcare group established to maintain the past progress at Kalinga Park with their web page in the 'Bushcare section' for this site. Fish snapshots have been an important part of the Kedron Brook Catchment Branch and Network projects since at least 2002. These relate to water quality measurements at four to five representative locations along the Brook at least once a year. There are a series of illustrative web pages in the Education section about Ferny Grove State High School students carrying out such a water quality study including fish observations. References to procedures are also given. Summaries of the results of most of the Fish Snapshot surveys are available in an irregular format from the Kedron Brook Babbler newsletters (see the downloads page for access or use our Search facility to get you there faster). Recently, the summary report, 'Kedron Brook Catchment Summary of Fish Snapshot Results 2002 - 2009', was compiled by Lorena Spangen and Anna Bourke covering the years 2002-2009. This report (656 KB pdf file) gives the information in a methodical and diagrammatical form. Fish snapshots were not carried out in 2010 due to doubts raised about the required legislative changes needed for proper care and protection of animals (which affected certain aquatic wildlife). These surveys were recommenced in 2011 when our fish sampling and identification procedures were adjusted to be in accordance with recent Brisbane City Council policies relating to the legislation. Kedron Brook Catchment Branch commenced a Frog Census in March-April, 2007. Following keen interest from members, there was a special workshop on frog identification and surveying their species and location in October. This project continued through 2008 and now is ongoing into 2011 as long as adequate rainfall occurs. Details will be given when relevant on our web page. Since 2008, small groups of our members have been carrying out a systematic approach to determine the number of bird species to be found at representative locations; mainly along Kedron Brook but also it's major tributory, Cedar Creek. These locations are in parklands with significant forest remnants along the Brook spread from near its source to its outfall into Morteon Bay. Walks are being carried out once per month (less December and January) and at a specified locations so that year to year variations may be determined. Over a longer period, the results may indicate whether bird biodiversity is stable or at threat with time. The initial records of bird observations were originally kept in the 'News and Events' section but now have been relocated and start with the 'Bird observations - Recent information' page in the 'Projects and Funding' section. This gives general information followed by any results of observations for the current year. As each year finishes, the data for that year is then put on a new separate page for that year and deleted from the 'Recent information' page. This entrance page thus serves also to always feature the results of the current year. Go to the 'Bird observations - Recent information' page for the start! 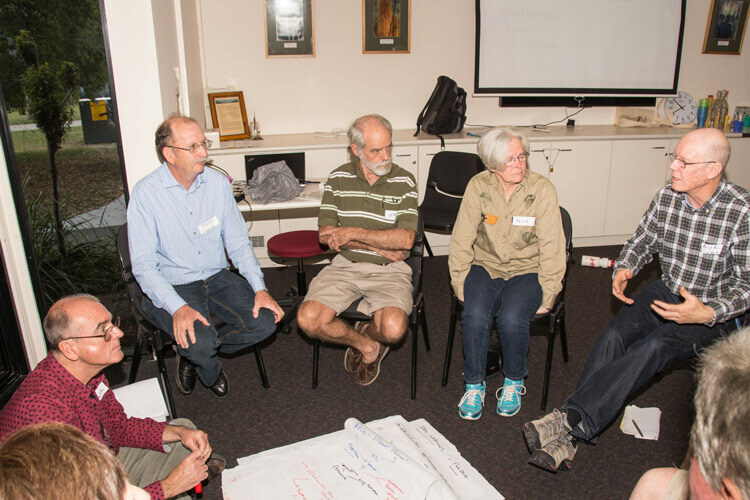 The Kedron Brook Catchment Branch of the Wildlife Preservation Society of Queensland has prepared an educational program on catchments and ecological monitoring. The program is tailored to schools within the water catchment of Kedron Brook and was introduced to some schools in 2007. An experienced educator and a biologist designed the two hour hands-on environmental science program. It is facilitated either by the Kedron Brook Creek Ranger, a KBCB educator, or the teacher, while the outdoor activities are facilitated by educators with experience in waterway monitoring.This opportunity will be available in 2012. Details are given on our web page. Weeds have always been a close interest of this network. Initial development of procedures and training of network members was carried out by our previous catchment coordinator, Kylie Withers. From late 2005, our Coordinator, Nathan Kirby, fine-tuned the existing survey worksheets so that they were more easily adapted by bushcare groups. He trained relevant individuals and groups throughout the catchment. Weed assessment and prioritisation training was carried out during 2006 on a 'tool-box' approach, branch and network meetings, and finally a catchment workshop in November 2006. The results of surveys conducted on these 'remnants' have been appraised and action priorities determined based upon the types and severities found of weed infestation, in relation to the immediate and long-term needs of the bushcare groups, the community and the local authorities; Brisbane City Council and Pine Rivers Shire Council (now Moreton Bay Regional Council). Nathan developed and detailed procedures to determine the priority of various significant weed removal strategies and mapped the results of this information to assist responsible bodies to determine future actions required on a priority basis. Details are given on our special web page. 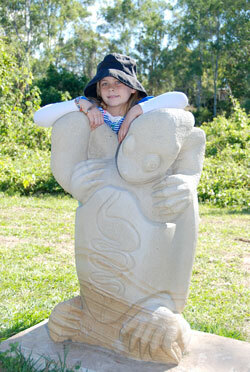 An Art and Sculpture Project was completed along the Brook at Mitchelton in 2008. Helen Moriarty and Janet White of the Osborne Road Habitat Brisbane Group were responsible for coordinating the project on behalf of KBCB and worked closely with BCC, Mitchelton Pony Club and other local groups and residents. A mosaic tile covered seat is situated near the Osborne Road end of the bridge. 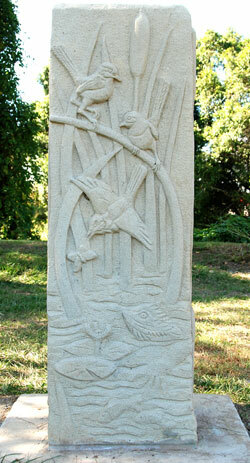 It is covered with beautiful scenes depicting bird and aquatic wildlife. Link here to see part of its detail. A range of grants and funding opportunities are available for external funding sources. Kedron Brook Catchment Branch (WPSQ) is happy to assist network groups and individuals with developing a project and applying for funds for projects aims at improving our catchment. Moreton Bay Regional Council- Community Assistance.